We’re a little to the game on this one. When I first heard of the “Refresh your World” (Refresh Everything) program, I thought “no way people are going to be into this” – but I was wrong. I can tell from the amount of comments on our Facebook Code Giveaway Fan Page that people actually use these codes! So here we are – same drill as usual. 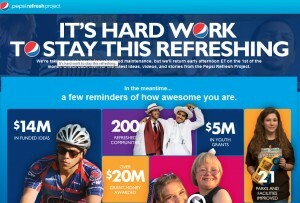 I will, along with anyone else who is feeling generous, give away every Pepsi Refresh cap code I come across on this page. From what I have seen, the caps are yellow. They can also be found on the back of paper cups sold in fast-food stores, etc. The codes can be redeemed at refresheverything.com. Comments are held for moderation before they are posted. While we have a very friendly atmosphere here, I keep the moderation pretty strict. It boils down to this: If your comment does not contribute meaningful content to the discussion of the Pepsi program, it isn’t going to show up. Begging or trading requests will also not show here (see above). Again – please, no begging. We leave codes at random times in the comments below. Begging doesn’t speed anything up. And the sharing starts…… now!